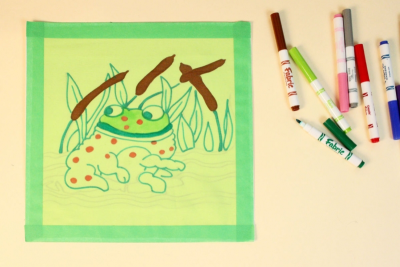 Students colour on cloth with fabric markers to create a visual souvenir that acts as a reminder of their experience reading a story and what they have learned from it. Think of the images that come to mind when you remember the story. - What is the strongest picture that you think of when you remember the story? 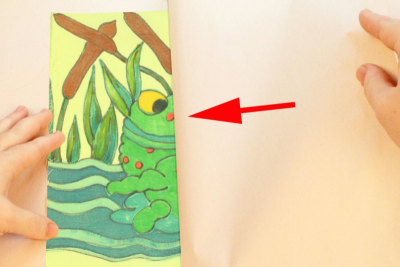 Draw that picture on the copy paper. 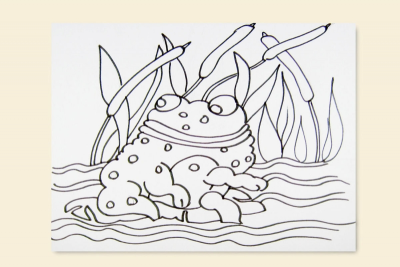 Use a fine line black marker to outline the drawing. 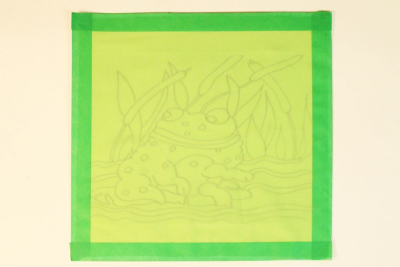 Tape the drawing onto a piece of white Bristol board using 4 small pieces of tape. 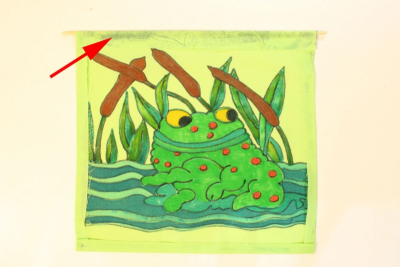 Place the fabric on top of the drawing. Tape it in place with long pieces of masking tape along each side. 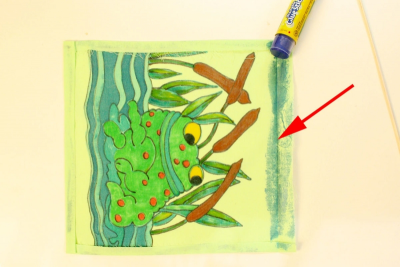 Use fabric markers to colour the picture directly onto the fabric. 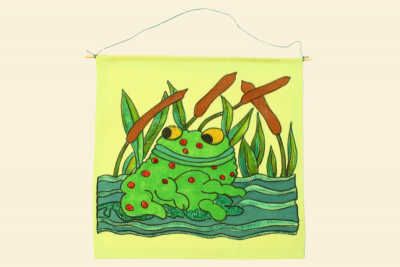 Place the fabric with the good side facing down on top of a pad of newsprint. Place a piece of blank newsprint on top of the fabric. 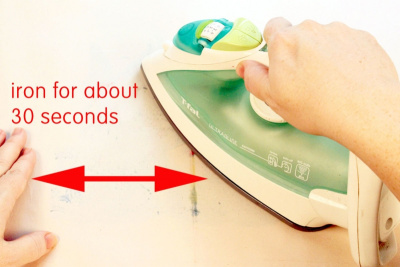 Set the iron to cotton. Iron over the newsprint for about 30 seconds. This will set the colour and make it permanent. Fold the edges of the fabric under about 1 cm. Use a glue stick to glue them flat. Place a bamboo skewer along the glued surface at the top. Fold the fabric over to hold the skewer in place. Attach yarn or ribbon to each end of the skewer. Add glitter glue to highlight some areas of the design. - What is there about this picture that reminds you of the story? - What are some of the things you remember about the story? - Why is this a good souvenir of the story? create a class display of souvenirs they have collected. Prior to this lesson complete a novel study with students. Download and display the Colour, Shape, Line, and Repetition posters available on this website. 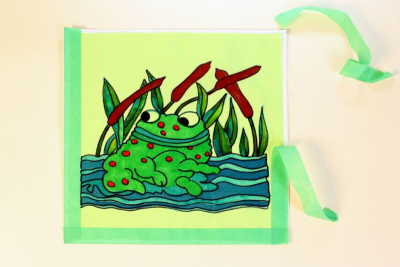 Cut polyester cotton into 30 cm squares, enough for one per student. Gather a variety of souvenirs. View and discuss the souvenirs. - What are souvenirs? – 'se souvenir' is a French verb meaning to remember. Souvenirs are mementos that people keep to remind them of an experience. - Why do people buy/collect them? Encourage them to think of an image that stands out in their mind for the story they have been reading. Compose a design that reminds you of the story you have read. Explain how your story souvenir connects with the story you have read. - Share their designs and take turns discussing the things that are especially effective and why. - Talk about how the design connects with the story. - Talk about why the design is an effective souvenir. 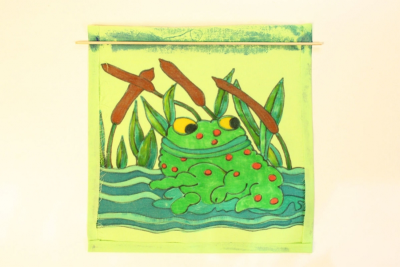 Observe students as they discuss the souvenirs – active listening, insightful contributions, supporting ideas with evidence found in the artwork and from personal experience.